This vibrant fine-art montage conatins 120 photographs of the state's name in a wide variety of sizes, shapes, colors, and materials. Each of Ilinois’ 102 Counties are represented, from Cook to Gallatin, Rock Island to Vermillion. Printed on heavy gloss paper, this 18"x24" standard poster-sized print is perfect for framing, and includes a legend identifying each photo's county, as well as photographers notes. Each montage print is also signed by Chris Landis, Illinois’ official State Art photographer. 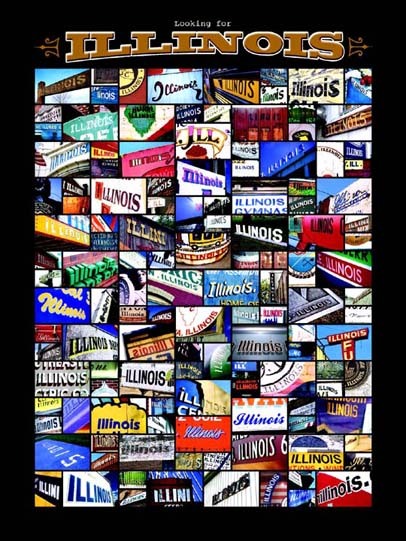 The Illinois montage print is a statement of pride in Illinois, and makes a wonderful gift for anyone who has ever lived in or visited our beautiful state.